If you've decided that you want to turn part of your lawn into a vegetable garden, where do you start? Here's one way to go about it. First, rent a sod cutter or use a mattock to take out the grass. (Be sure to take up all of the roots or, before you know it, grass will start growing again in your new garden.) Then turn the soil, using either a shovel or a rototiller. After that, amend the soil with compost and perhaps test the soil to see if there are other micro-nutrients that need to be added. When you have worked all of that into the soil, then rake it out, break up any remaining clods, and prepare the bed for planting. 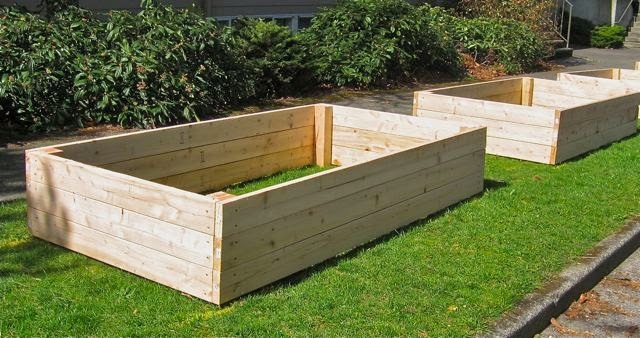 OR - skip all of that and build raised beds right on top of the grass. You can build frames like the ones shown above, using cedar 1x6 planks and 2x2 corner posts. These particular frames are about 18" deep, deep enough for root crops like potatoes or carrots. But beds don't have to be that deep - 8" to 12" is adequate if you intend to grow herbs and flowers. To smother the grass so that it doesn't come up into your raised bed garden, try this simple sheet composting method. First, if the grass is dried out, splash a little water on it. You want it to be moist as though it had just rained. Now sprinkle a very thin layer of compost over the grass. Over that, lay newspaper, 4 or 5 sheets thick, being careful to completely cover all of the grass. Now spread another layer of compost over the top of the newspaper and sprinkle a bit of water over it. Then add clean topsoil to fill the raised bed and plant your garden. The newspaper will keep the grass from growing and the micro-organisms in the compost will break down the dead grass and newspaper. It takes about a year for this process to be complete. In the meantime, over the top of it all, you are growing and harvesting food for your table.